Since 1993, Finis has been providing swimmers of all levels with some of the best swimming apparel and equipment. Pablo Morales, a former gold medalist in swimming, was one of the founders of the company. This means that brand is influenced by people who truly understand swimming. Finis is a brand that offers innovative and fun swim wear and equipment for recreational, amateur, and professional swimmers. Learning how to swim is a skill that's going to last a lifetime. Whether it's training for a serious competition or simply learning how to maneuver in a swimming pool, Finis offers the right swim wear and equipment for everyone. Some of the most popular swim wear products from Finis are the fins. 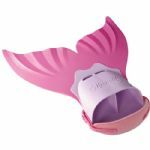 When it comes to learning how to swim, fins are very useful. 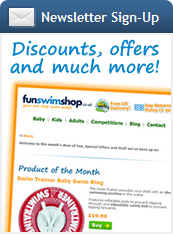 Swimming fins provide the support necessary to develop good swimming skills. They are ideal for beginners who are just getting comfortable with moving around in the swimming pool. Fins also have great applications for more advanced training, such as developing butterfly kicks and other moves. 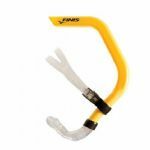 Finis offers a variety of swimming fins for different ages and levels. 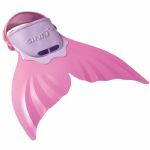 The stylish Finis Mermaid and Shark monofins are perfect for children under 12 years old that are learning how to swim. The Wave and Rapid monofins are great for recreational use, and are designed for kids and adults. One of the most innovative products offered by Finis is the SwiMP3. This is a waterproof MP3 player that sends sound signals through bone conduction technology. Such a method of sound transmission eliminates the need for headphones, which is used with all other types of water resistant MP3 players. This type of waterproof MP3 player actually sends the best possible sound quality when in water. 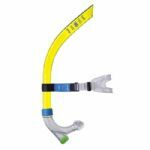 The Finis SwiMP3 easily attaches to the goggles or snorkel mask and has simple control buttons.